Question: Why has your soybean forecast trended above trend yield but your corn forecast has been below trend since the start of the season? Why do you see that divergence at this stage in the growing season? 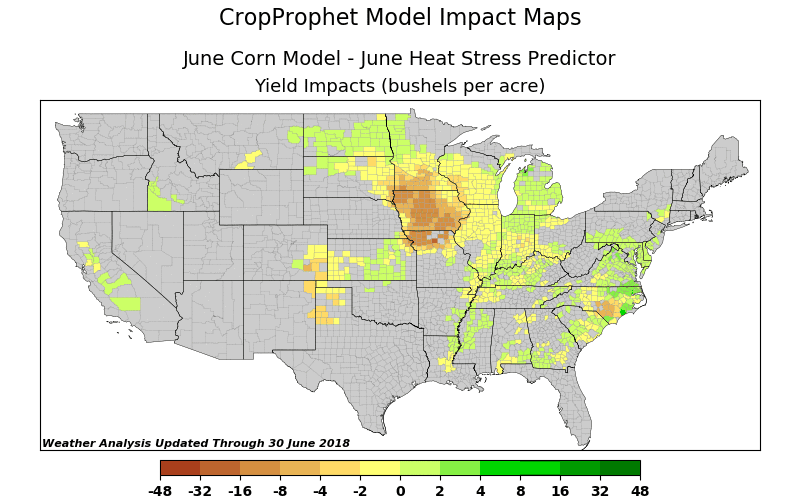 CropProphet facilitates the diagnoses of the driving factors behind a yield forecast. As a result of many years of observing the modeling system, we have learned corn is more sensitive than soybeans to early season (i.e. April, May, and June) weather conditions. We’ve frequently have internal discussion on the primary drivers of early season predictability (direct phenological responses vs correlation with midseason weather, etc. ), although in the end the reasons don’t matter since the model is detecting influences that have statistical significance and predictive value. The weather during the start of the 2018 crop season has been quite volatile in the U.S., with widespread record cold in April reversing to record warmth in May. June was been quite warm as well, with localized heavy rains in part of the NW corn belt. Our view is that the record cold in April was detrimental to corn, but only in northern sections of the Corn Belt where the growing degree days were reduced compared to normal and where the climate requires the crop to have as long of growing season as possible. 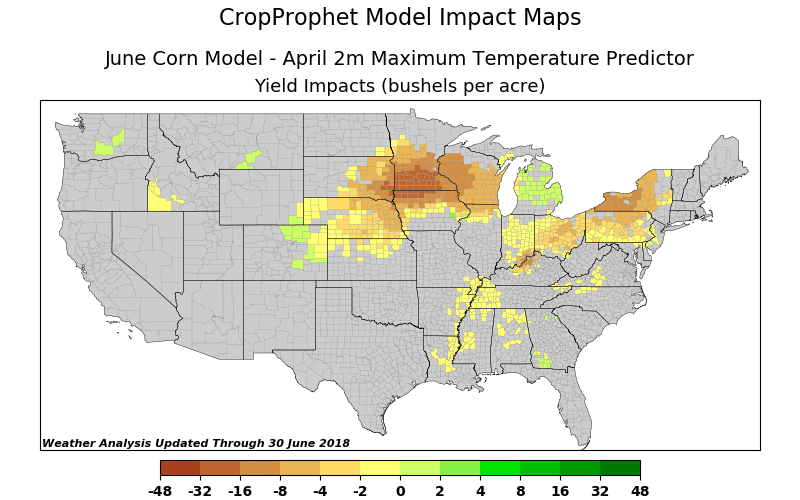 Below is a graphic demonstrating the county level impacts of our April maximum temperature corn yield predictor, which shows the negative impacts of the cold in April. Note that this impact is primarily found in the northern Corn Belt, suggesting a physical relationship caused by the colder climatology of that region. In contrast, our soybeans models do not have a significant impact based on maximum temperature. With regards to the rapid warm up in May and June, the early season heat was been detrimental to corn, but overall beneficial to soybeans. Attached is the impact from heat stress on corn yield. The same predictor is not as significant for soybeans this early in the season, but becomes more important in July. However, the soybeans growing degree day predictor shows an overall positive impact, as shown in the map below. Soybeans tends to thrive in hot and moist conditions, which is why it is more widely grown in southern Mississippi Valley. These example explain some of the differences noted between the corn and soybeans deviations from trend. This type of analysis and the information provided are the types of tools our team has access to while writing the CropProphet Weekly commentaries, available to certain subscribers. CropProphet is used to aid in interpretation and analysis of the model forecasts allowing us to provide valuable insights in our commentary.